This Ravioli al Pomodoro recipe is an easy Italian one skillet meal made with San Marzano tomatoes, fresh mozzarella cheese, and absolutely packed with flavor! I am sharing a meal today that is so easy, yet tastes like it came straight out of a restaurant in Italy. I feel that I can safely say this since I’ve vacationed in Italy a couple of times and Italian food is my absolute favorite cuisine! You may think I have to say that since I am Italian, but I truly mean it. There has never been a day in my life where pasta didn’t sound good to me. This Ravioli al Pomodoro is definitely a new favorite! 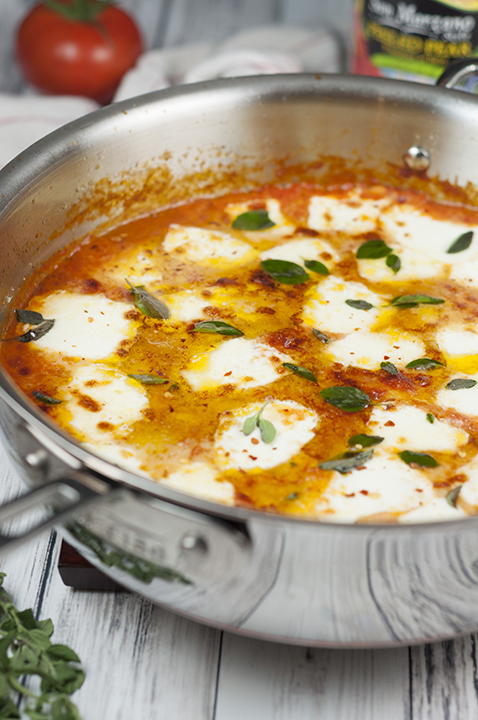 Anything topped with fresh, melted mozzarella and I’m all in. I have had some crazy food aversions during this pregnancy and they seem to get stronger as the weeks go by, but Italian food is one thing that has never failed me. Even if I have to eat plain pasta with butter and garlic, I know it will be there to save me from my “nothing in the world sounds good to me right now” moments that I have all too often! I used my favorite brand of tomatoes in this Ravioli al Pomodoro – Tuttorosso tomatoes. 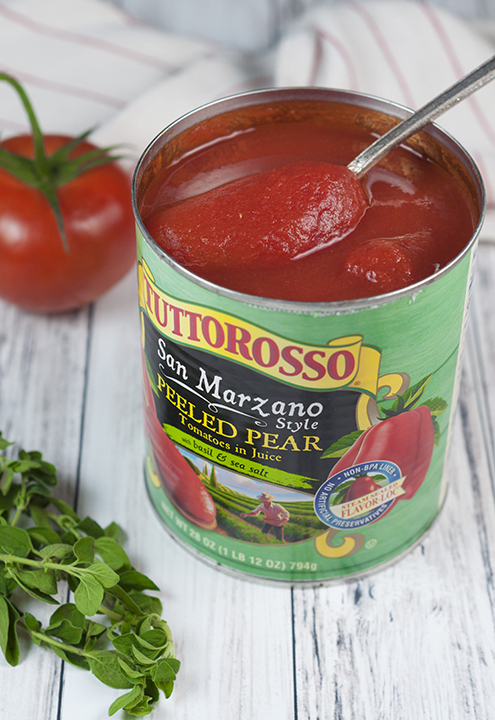 Their products never let me down so I was really excited to try their brand new product – San Marzano Style tomatoes. I don’t do a lot of cooking with San Marzano tomatoes, not nearly as much as I should. I have found they are the best-tasting tomatoes when making a red sauce in order to achieve maximum flavor. The flavor and texture of these tomatoes did not disappoint and I’m so happy to have a new kind of Tuttorosso tomatoes to cook with from now on. In case you aren’t familiar with them, San Marzano tomatoes are a variety of plum tomatoes. If you compare it to the familiar Roma tomato that you probably cook with often, San Marzano tomatoes are thinner and more pointed. The flesh of these tomatoes is much thicker with fewer seeds, and the taste is stronger, sweeter and less acidic. They really have so much flavor that there is not much that even needs to be done to them. There is your tomato lesson for the day! Tuttorosso is family-owned and prides itself on the quality of their tomatoes which I have come to really appreciate over the years. My dad always used their products and nobody took more pride in their cooking than he did. I carried on the tradition in using Tuttorosso! After all, they’re the best-selling Italian inspired canned tomato brand in the U.S. for a reason. With Tuttorosso’s non BPA lined cans, you don’t get that metallic tin flavor that can be a huge turn off. The new San Marzano Style tomatoes are no different. They are preserved using their Steam Sealed Flavor-Loc system. It’s the closest you can get to picking a tomato straight from the garden. I use their tomatoes in my Cheesy Tortellini Skillet recipe! 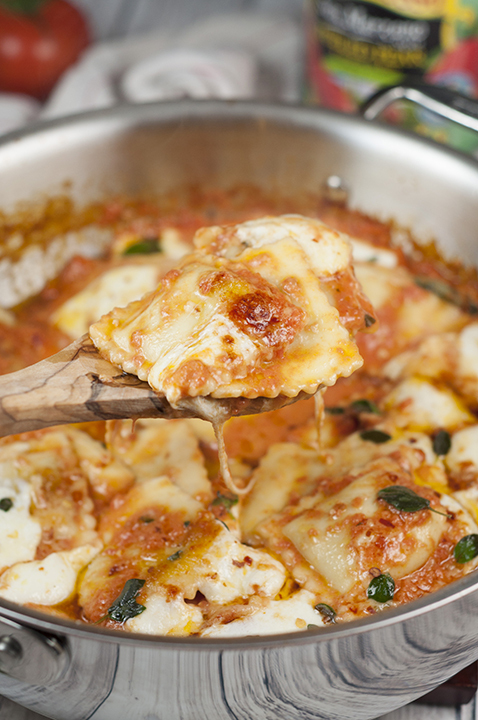 This Ravioli al Pomodoro is very filling and hearty without the sauce being overly heavy. Traditionally, Pomodoro is a light tomato pasta dish packed with fresh basil, garlic and Parmesan cheese. It’s so easy to make and so delicious! Make this soon and see how happy even your pickiest eaters will be. 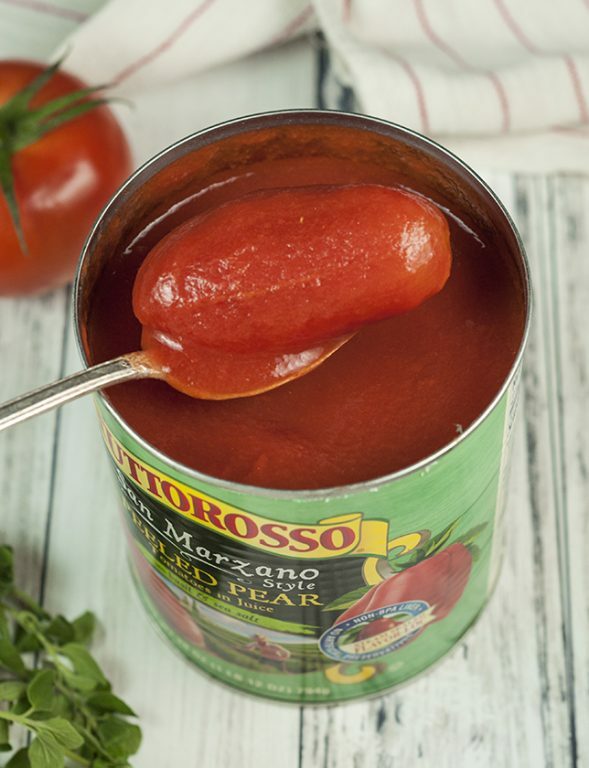 Tip: Tuttorosso’s delicious products can be found on Amazon or use their handy store locator to see where you can get their products at a store near you! This Ravioli al Pomodoro recipe is an easy Italian one skillet meal made with San Marzano tomatoes, fresh mozzarella cheese, and packed with flavor! Add your olive oil to a large skillet or sauté pan and heat over medium heat. Lower the heat, and add the onion and garlic to the oil, being careful not to burn garlic. Cook until the onions are transparent, about 5-7 minutes. By hand, crush the San Marzano-Style tomatoes and add to the pan with the juice. Season with salt, black pepper and red pepper flakes and simmer for 30-40 minutes, stirring occasionally, until the sauce reduces and thickens. Stir in the heavy cream until incorporated and remove pan from heat. Bring a large pot of salted water to a boil and add the ravioli. Cook according to package directions. Drain water; place the ravioli into the cooked sauce. Top with the mozzarella pieces and sprinkle with Parmesan cheese. 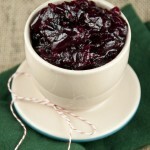 Drizzle the top with your 1 tbsp. of extra olive oil. Broil in oven for 5-7 minutes or until the cheese melts and the tops become crispy. Garnish with fresh oregano and serve hot. Enjoy! This looks AMAZING, Ashley! That ooey gooey melted cheese is definitely calling my name! That is everything I have ever loved about Italian food. It’s so cheesy, gooey good! I can’t wait to try this. I am obsessed with fresh mozzarella/tomatoe combinations. Pasta, pizza, or really just about anything. Also, San Marzano tomatoes really are the best (imho) for pasta dishes. My family also traditionally uses Tuttorosso products for pasta sauces for as long as I can remember. They really are the best. I love cooking dishes that just use one dish to make. This could easily be part of a three-course home cooked meal for Valentines. This recipe sounds downright amazing! 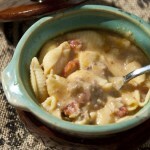 You have a great combination of flavors in there, and it sounds like a great balance of sauce and cheese / heavy cream. I haven’t tried those tomatoes and it’s good to know which ones are good. This looks sooooo good! My kids love all things pasta so I may have to make this one for them. My kids like pasta but my oldest doesn’t like tomatoes much. Mostly because of the acidic taste. He won’t eat raw tomatoes at all. These sound like a great choice & something he may like. Now this looks delicious!! I am a pasta fanatic and so this recipe is right up my alley!! How delicious! I have never tried anything like this before, but it would be the perfect meal to fix for my upcoming anniversary. Thank you for sharing the recipe! Yum, this sounds delicious. We are so tired of the same meals over and over and I’m on the lookout for more recipes to try. I will have to add this one to my to my rotation. Wow! This looks super delicious! Certainly makes enough to have over some dinner guests too! That is everything I love about Italian food. It’s so cheesy and yummy! I can’t wait to try your recipe! Oh yum! Ravioli al pomodoro sounds delicious and it looks like it’s super easy to make. I will have to try this out soon. My family loves Italian dishes! That looks divine! Honestly, I can’t remember the last time I’ve had ravioli. That said, this is going on the menu next week. Thanks for the recipe! This looks amazing. I love pasta. It’s a favorite around here. 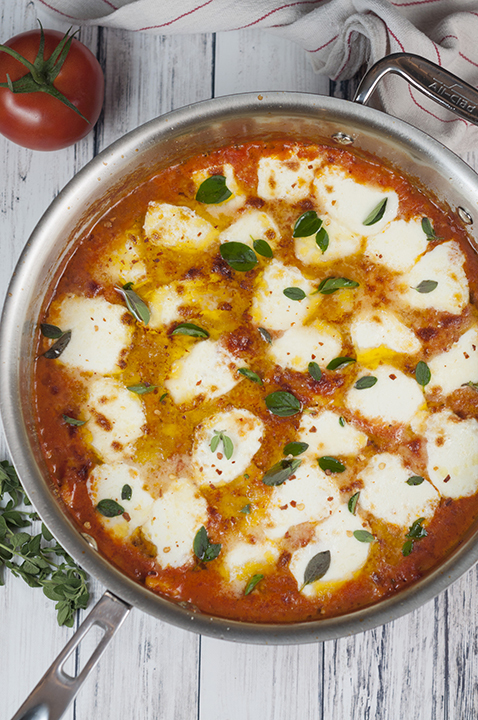 This looks incredibly delicious and I love the fresh mozzarella! 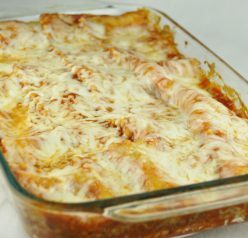 Going to make this this weekend! This dish looks so palatable, Ashley! I love Italian cuisine but I haven’t tried this dish yet. Thanks to your recipe, I’ll be able to prepare it at the convenience of my home. Can I also add red onion in addition to the yellow one?